So, apparently I've been away for a while! lol For some reason, I just had the desire to blog today. Perhaps it's because I'm sick of the drama and the dirty laundry all over facebook. The jealousy, the bitterness, the resentment, the anger, the spewing of words for the whole world to see because someone's in a moment of unhappiness....sheesh...I'm depressed already! I love facebook, and there are so many wonderful things about it, but I guess I just wanted a safe, calm, soothing place to express myself today. So, I've been absent from the blog world for so long, that the host doesn't do Thankful Thursday's anymore. Surely there is another link up somewhere for it, but for today, I'm just going to be thankful on my own...perhaps you might join me?? Today, I am deeply thankful for God's longsuffering..His patience..His willingness to put up with me in all my failures. They say the definition of insanity is making the same decisions an choices over and over again expecting different results. That's me! I wouldn't even say I expect different results. Perhaps I hope for, or wish there were going to be different results. Sometimes I'm not even thinking far enough ahead to the results stage...just the "what makes me happy now stage." :( Yet God, in all His goodness, doesn't leave me in this continuing state of insanity. He looks beyond my sin, beyond my self-destructive habits and choices, and shows me not just mercy, but also grace. He lovingly teaches me new things. Sometimes through trials, and sometimes through just delightful revelation of His Word. He keeps growing me, and molding me to be more like Him. I'm so thankful for that. So here it is that time of year again, where Christians debate the never ending debate of what to do about Halloween. I have read many posts and articles on the subject over the years. Some I agreed with, some that made me think, and some that I despised. You know what they all had in common though? Division and spite in the comments section. I can't tell you how much this breaks my heart. I see it as just one more thing that Christians divide themselves over. Along with wearing skirts or not wearing skirts, KJV only or using other translations, rapture or no rapture, homeschool or public school, full submersion or sprinkle, on and on and on and on, we continue to divide ourselves based on non-essential issues. Why do we do this? Are we really so impressed with ourselves that we truly believe we have all the right answers, and millions of others who serve the same True Living God must have it all wrong? Do we feel like only we have a direct line to God and all His wisdom, therefore it must be our job to set everyone else straight on their misguided and misinformed views and decisions? Let's really think about this for a minute. Also, please know that I have been guilty of this myself, many a times. However, through the grace of God I want to STOP!!!! It is NOT our job to be the Holy Spirit in anyone's lives. Believe me, it isn't a job that any of us really want anyway. It may seem great, but we all fall so incredibly short from being qualified to do that job, and God will hold us accountable for trying! Only God knows His ways and His specific will for His people. We know the general; that God wills for us all to be saved, grow in sanctification, become more Christ like, be a vessel to further the Kingdom and live a life pleasing to God. However, only God knows the how, why, when, where and what of the way that looks in each individual. Unless something is stated clearly and undebateably in scripture, we have no right to chastise anyone for anything, and declare our supreme knowledge over their failure or ignorance. It breaks my heart how much we hurt one another in the name of what? In the name of a God who doesn't NEED us to do anything that HE wills? Do we really think God wants or needs us to hurt a fellow brother or sister in Christ in order to make His ways known to them? Oh, fellow Christians, no. No, He definitely does not desire that. I can say that, because that is clearly and undeniably in scripture. Though shalt love thy neighbor as thyself. You must remove the plank from your own eye before you can remove the splinter in your brothers. There are many, many more. I believe we can say what we believe, as we are all commanded to be ready to give account for what we believe. It is not our job though, to criticize our fellow believers for their beliefs. I truly believe that one Christian can celebrate Halloween and be just as much in God's will as another Christian who doesn't. I believe a sister wearing a skirt can be just as much in God's will as one that is wearing pants. Being in God's will is not following a set of rules or laws. God already said we can't follow the law, and that's why He sent His Son to pay the wages for our sins. What God HAS asked us to do, is walk in the Spirit. Follow His leading. We don't know what the Holy Spirit has asked our fellow brothers and sisters in Christ to do, so we can't point a finger of accusation and self-righteousness. Worry about what God has asked you to do, and not what others are doing. Even when you feel someone is living in sin, extend grace to others.... remembering the grace that God continually extends to us in our daily disobedience. Just imagine how strong we would stand, and how effective we would be at evangelizing, if we closed the divide, and only stood on what was truly essential to salvation! True believers across the globe would be a force to be reckoned with! I just wanted to share that on the 16th of October, my husband lost his mother who was only 60 years old. She battled diabetes, Rheumatoid Arthritis, and Alzheimers. Although his has been an incredibly hard time, we have seen God's sovereignty all throughout and He has clearly shown His goodness and faithfulness! We believe she still knew Him and her hope of eternity with her Savior when she passed. (Which was our prayer) Even though she couldn't speak or move, we believe she knew her boys and husband were by her side, because she went extremely peacefully. From the time she got her early onset Alzheimer diagnosis, it went pretty fast. Although that would be hard for many, it was a blessing for us, because we didn't want years of drawn out declining memory and loss of who she was as we had known her for so many years. She watched her own mother die of the same disease and it was a long drawn out, and awful process for her to witness. She wouldn't have wanted that for us, and had she been aware of what was happening to her, she would of been happy it went the way it did. The point I really want to drive home today, is that when I got married 15 years ago, I didn't get a mother-in-law. I got a second mother, a best friend, a spiritual mentor, a prayer warrior, and the world's best babysitter! When two families combine, it is not always a good thing. Many people dread having to see their mother-in-law, daughter-in-law, etc.. Can I please suggest to you today, that you make the very best of it that you can?! We are only here for a very limited time. The Bible calls our lives here just a mist, a vapor, and then we are gone. What lasting legacy are you going to leave? What will people, and family say about you when you are gone? Did you leave a lasting impact on their life? It is a positive and special one? When your mother-in-law passes, will you be able to say that you lost a best friend? If not, is it because of her actions, or yours? Truly? Let's make the best of our short time here on earth, and ask God to help us to put aside selfish feelings and agendas. They are so temporary, but the healthy relationships we build and work on can have a very long lasting impact!! Sounds awesome, doesn't it?! It certainly has been so far. I have already shed some tears...okay, lots of tears...and feel God working within my heart. The thing that has stuck out the most to me so far, is that for so many of us (even long time strong in the faith believers) our view of God has gotten smaller. Whether it be through prayers that seem to go unanswered, trials that seem all to frequent and difficult, Pastor's and biblical leaders who preach and teach that we are to just sit and be happy with what God has given us, or just the overwhelming amount of pain, suffering and evil we see all around us today; we seem to have lost the reality that our God is HUGE and bigger than all these things! Are we to find joy and contentment in the midst of our everyday circumstances? Yes. Are we to accept that there will always be trials and difficulties? Yes. Should we understand that it is for our good that some prayers go "seemingly" unanswered? Yes. Does it grow increasingly difficult for every believer to see the pain, suffering and evil ever so present in our day? Absolutely. However, do we need to take a step a step back, take in a deep breath, re-read our scriptures and have hope in a God of miracles, that He can still do huge and drastically wonderful things in our lives? YES!!!! We've got to have hope. This life is too depressing without it. We won't always get our prayers answered the way we want, because God cares most about what is going on in our inward person, but that doesn't mean He doesn't greatly act on our behalves in the outward! Go back and read through the miracles in the Bible, and in the majority of them, you will find the words "because of your faith," "your faith has made you well," "because you believe." Faith pleases God. It's a known biblical fact. When we reach out in faith, He is often moved to then act in our lives and in the lives of those whom we are praying for. Let's not put God in a box and say we know exactly what He will and will not do. His ways are above our ways, and He is sovereign above all. Let's believe Him for the miracles we need. Whether it's healing, salvation, reconciliation, freedom, financial, a mountain in the way...whatever it is. Let's believe Him for it, with unwaivering and undoubting faith. Let's not give up, and not give Him a timeframe to answer us to our satisfaction. Let's put our whole being into believing our God is the HUGE God of miracles until He delivers it to us, or closes the chapter. If and when He delivers us our desires, let us praise Him for it far and wide. On the other hand, if and when He does close the chapter on our petition, let us know that it's because the work He is doing within us is more important than the outward. Just my thoughts this week, and what God is speaking to me about in my heart. Any thoughts of your own?! 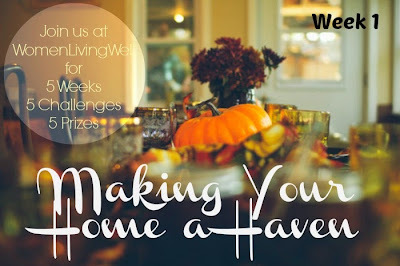 Just click on the picture to go to Courtney's Blog and the challenge! The last two, almost 3 weeks have been some of the hardest I've ever gone through. My boss and long time friend lost her 17 year old son on July 5th. What's worse, is he killed himself. My husband and I have been friends of the family for over 10 years, and I also worked with the mom, oldest daughter, and this boy who ended his life all too soon. We have no answers as to why, and maybe that's for the best, as no one can place certain blame...but it also leaves room for everyone to place uncertain blame. We are all struggling, and hurting so deeply. This boy touched our entire town, and surrounding town, as he was an amazing person. He was an incredibly talented football player, and took state two years in a row with his team. Please pray for our community, myself, and especially the Leishing family. Thank you so much..